Up to 80% of the risk of developing Alzheimer's disease is genetic, a study has suggested. US researchers looked at almost 400 sets of elderly twins, where at least one had Alzheimer's. It also found that genetic factors appeared to determine when a person developed the condition. UK experts said the research, published in the journal Archives of General Psychiatry, would help quantify the role genetics played. 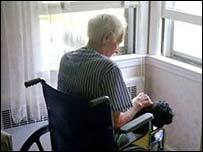 Two-thirds of adults aged 65 years and older with dementia have Alzheimer's. The number of cases is expected to rise with the growing older adult population. Gene mutations which could affect risk have been found, but it is thought they only apply to a tiny number of cases. Scientists trying to determine whether genetic or environmental factors influence disease risk often study twins. Identical (monozygotic) twins share all their genes. So if a disease does have a strong genetic basis, it is likely to be seen in both or neither. But if only one has a condition, it is likely that environmental factors play a relatively greater influence. In the US study, researchers from the University of Southern California, Los Angeles, and colleagues identified 392 pairs of twins where one or both had Alzheimer's from the Swedish Twin Registry. All were aged 65 or over. The researchers looked at how common it was for identical twins to both have Alzheimer's, or for only one to be affected. They also looked at the same patterns in non-identical twins. It was more common for identical twins to both have Alzheimer's compared to non-identical, and a statistical analysis of risk rates in the groups gave the researchers their estimate of how significant genetic factors are. The researchers estimated heritability - what proportion of risk for a disease across a population is genetic - for Alzheimer's to be between 58% and 79%. Where both twins had the disease, there was an average of 3.66 years difference in age at onset between 25 sets of identical twins, and 8.12 years difference between 20 sets of fraternal (dizygotic) twins, suggesting genes had a role in determining when Alzheimer's was seen. Writing in the journal, they said: "In the largest twin study to date, we confirmed that heritability for Alzheimer's is high and that the same genetic factors are influential for both men and women. "However, non-genetic risk factors also play an important role and might be the focus for interventions to reduce disease risk, or delay disease onset." She added: "If individuals are worried that they may be at elevated genetic risk due to family history and are looking for lifestyle suggestions, possibly the most reliable advice we can offer today is that a healthy heart is related to a healthy brain." Susanne Sorenson, head of research at the UK's Alzheimer's Society, said: "Researchers have wondered for many years the degree to which genetics plays a part in the development of the common, late onset Alzheimer's disease. "This study makes advances towards quantifying this relationship and will help scientists to understand more about the role of genetics in the development of the disease. "However, we still don't know enough. "More research is needed into the role genes play in developing late onset Alzheimer's. "We also need to better pin down the environmental factors that may increase a person's risk of developing the disease."